So, our anniversary movie choices basically came down to Murder on the Orient Express and Lady Bird. Sure, we could have seen Geostorm, but with a 14% Rotten Tomatoes score.....and the fact that it was a disaster movie...it wasn't on my top 143 movies to see. Due to timing, dinner and the fact I didn't want to pay to see Johnny Depp pretend he was anywhere in the same league as Judi Dench, we opted for Lady Bird. It was an odd night. The indie theater is usually packed with lines out the doors. There were zero people in the lobby when we got there. No one in line for tickets, sno-caps or popcorn. ....and not one person in the poopery. As it would turn out, for some inexplicable reason, Lady Bird was showing at the two largest screens in the place. They have never shown the same movie in different rooms. I figured it must be VERY good and packed. ....I think we had two dozen people in our theater. 19:00 on a Friday. We were perplexed. Per cinaplexed, as it were. On paper, Greta Gerwig's directorial debut (she wrote it too, but not her debut as a screenwriter) seemingly had all the right elements. She has the indie cred (though I think I've only seen her for two non-sequential minutes in Jackie and one Arcade Fire video, where she looks just like "Pam" from the Office). The movie stars the always great Saoirse Ronan and Laurie Metcalf. Lucas Hedges, the teen from Manchester by the Sea also appears. With a 100% (!!!) Rotten Tomatoes score and a 94 from Metacritic, I'd assume the story would be a good one, or at least an original one. The coming of age story that has all the requisite components of many John Hughes movies: wrong side of the tracks; wanting to hang with the popular kids; wanting to be boyfriends with the cool/popular boy; abandoning your one true friend. .....and yes, prom. 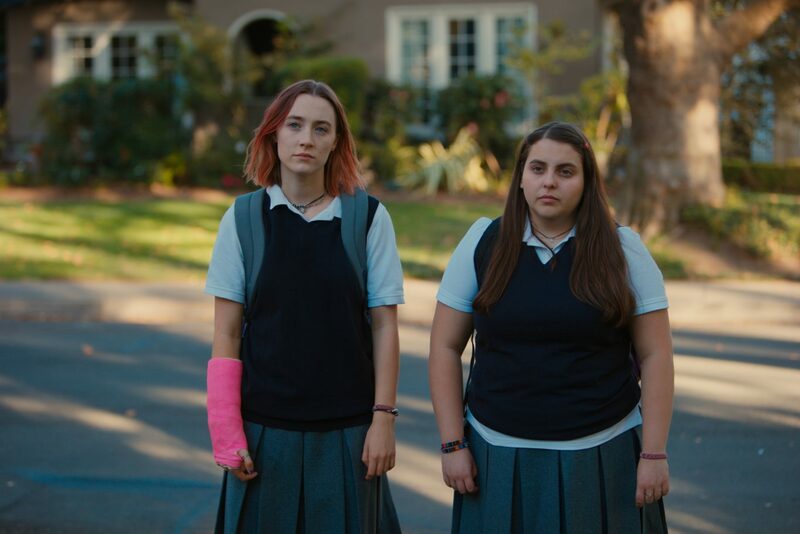 Along with that, you get the contentious relationship between mother and daughter, all that is wrapped up in three lines of dialogue between Ronan's Lady Bird and a nun. I will say this, I did like the performances by Hedges and Lady Bird's friend, Julie (Beanie Feldstein). While well acted (though neither are the lead's strongest performances), and the script is fairly well written, I'm not feeling this as a 94-100% anything. It was all ok but no new ground was covered, no revolutionary performances. I'm not understanding the over the top hype of the reviews I've read since. Of course, I thought it was just me feeling this way, but 710 had the same reaction. It will be tough to halfway meet this year's goal, but I still want to see Three Billboards, the Last Jedi and Phantom Thread. Currently, that still leaves us two short. ....and only six weeks to go. I'd not heard of this one - and no wonder when it's not due for release here until next mid-FEB! Confirming what you've found out already, it's also getting a very high score on IMDb (currently 8.4/10) so I'll probably see it, though I'll bear in mind your rather more tepid response, for which I thank you. This is one of those wait til it comes to On Demand for me. We used to hit a movie a month back when we were young and wanted to get away from the kids for awhile. Now it's only action or science fiction, stuff that practically screams "big screen". We saw Thor last week. We got to the theater and wondered why it was so packed. It has twenty screens, for cruds sake and it was a Tuesday! Turns out, it was five dollar Tuesday. We lucked out because I have to use a wheel chair, so I bring my own seat, and have to pay for a space. Takes a lot of the torture out of going to movies. I also stayed awake, win/win. I haven’t heard of this one and sounds as if I don’t really need to be.